Its not too late to sign up! Another great regatta put on by some very dedicated volunteers last weekend. Friday, KYC was once again home to 20-some Sharks and their crew. The weather conditions could not have been more perfect for this class. Special recognition goes out to Lana Butler and her team of volunteers, Ross Cameron, Racing PRO, the KYC staff, all our valued sponsors, Geoff Webster the official photographer, the City of Kingston for their support, and of course our membership for being so welcoming and accommodating to the visiting clubs. Congratulations to Peter Van Rossem and crew of Jonathan Livingston Seagull, Mike Hull and crew of Dartos, and Steve Raddon and crew of Shadfly for placing first,second, and seventh in the regatta! Click here for photos of the event by Geoff Webster. Partridge Bowl BBQ Sign Up! Are you coming to the partridge bowl on July 19th? Don't forget to sign up for the annual BBQ held after the race at Jemmett's. This year we are offering burgers, sausages, chicken and veggie burgers along with various salads and all the fixings! Only $22 including taxes and gratuities. Please include the number in your party, dietary restrictions or meal choice inclinations (so we have a rough idea of what to pack!). Orange Peel will be going down and back (same day) and could take a few people. Those who are interested should indicate this in their RSVP. Come and enjoy an evening with Burry Vanderveer on the preparation for, and what to expect in cruising the Bahamas. 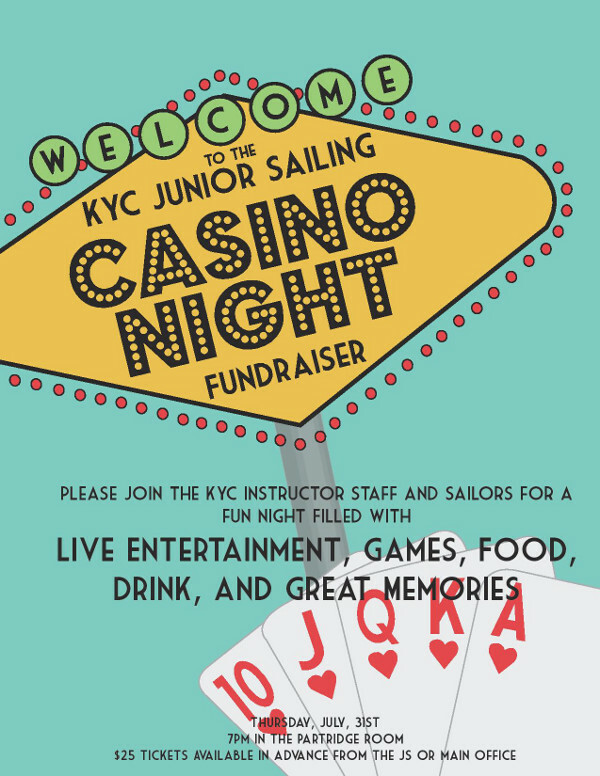 Junior Sailing - Casino Night Fundraiser! Thursday, July 31st for a full night of fun! There will be food, drinks, games, and good company for all. Guests will be required to purchase a $25 ticket from the KYC Junior Sailing office prior to the event. The trampoline has made a big splash off the T-dock this week. Come on down and check it out. Well, its been a busy week for F&B! We closed the main bar early in the week to make way for a much needed back cooler and expanded draft service. Things are noticibly picking up activity-wise around KYC these days. We are now carrying a larger selection of draft beers, served up as always in our chilled glassware.